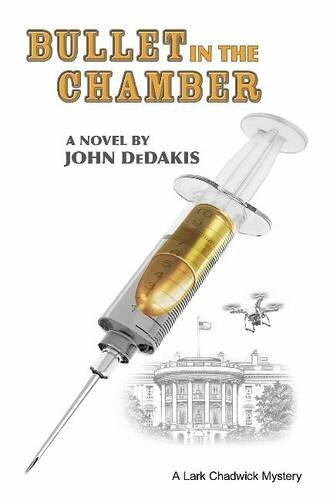 In “Bullet in The Chamber” by John DeDakis, White House Correspondent for the Associated Press, Lark Chadwick, is entering her first day at the White House. While waiting for newly elected President Gannon’s speech, Secret Service Agents fly into the room yelling, “Everyone Out. Now!” as they rush the President out of the room. Hours later, Lark and Doug Mitchell, her photographer and on again off again boyfriend, try to make sense of what happened. Regardless the questions Lark asked of White House Press Secretary, Lucia Lopez, Lark was still at a loss about what happened. Lopez would relate that the administration was investigating a possible drone attack. Lark, the up and coming correspondent, has no intention of jumping into a relationship with anyone. Doug, her sometime boyfriend suddenly disappears from a meeting and Lark finds herself dealing with mysterious texts, and dark secrets, which put her life at risk. Doug and Lark’s boss seem to have something in common, which has been hidden for years. “Bullet in The Chamber” by John DeDakis is an incredible talk of how the life of a correspondent is, and addresses the possibility of drone attacks on the United States. The author relies on his forty-five-year journalism experience to provide detailed, well-documented accounts of what goes on in the mind and hearts of White House correspondents. He dedicates this book to his son Stephen, who lost his life to heroin intoxication, an activity in which the character of Doug Mitchell partakes. DeDakis provides a gripping, realistic, and “can’t put down” read. Highly recommend this book.